In this video, we demonstrate the use of a novel cautery-tipped stent delivery system for drainage of the gallbladder after acute cholecystitis that was not responding to percutaneous drainage. There are 2 special features on this EUS specific system. Firstly, the delivery system is cautery-tipped, meaning the puncture of the organ and delivery of the stent system could be performed in a single-stepped manner. This avoids the need of changing instruments and the risk of bile leak during the process. Secondly, the lumen apposing stent imparts lumen to lumen anchorage. This allows the creation of an anastomosis and further reduces the chances of bile leak. Figure 1. Appearance of the cautery-tipped stent delivery system for the lumen-apposing stent. For a long time, EUS drainage procedures have been using devices that are designed for ERCP. 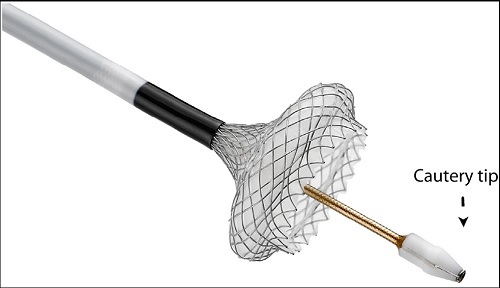 The cautery-tipped stent delivery system represents the first step in development of EUS specific devices that can potential reduce the complexity and improve the safety of these procedure. EUS drainage procedures are still evolving and the availability of suitable devices is important. Find more VideoGIE cases online here.